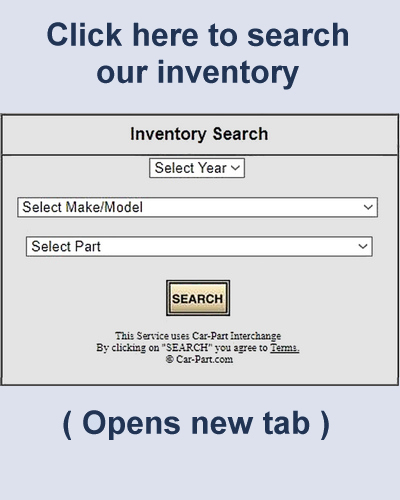 We have thousands of parts on hand that are not in our on-line inventory, and we can find almost anything else. Fill out the form below, and we'll find your part for you. In order to provide you with an accurate and fast reply, we require your VIN number. If you'd rather talk to a person than fill out a form, just give us a call at (800) 479-4808 . You can give us your credit card over the phone, or request a PayPal invoice by email ( a PayPal account is not required to pay with PayPal ). We accept all major credit cards or cash. We do not accept personal checks. We will send you a PayPal invoice ( a PayPal account is not required to pay with PayPal ). NEVER include a credit card number in an email !